I would love to have this since my computer was stolen. I have to visit my sister, which is nice, to use her computer. This would be great for my receipes. I love HP products. I’d use it to read books and surf the web. I would give it to my Mom. Her computer was ruined by my Nephew when he pulled the cords in back and damaged something inside it. She works so hard and just can’t find the extra funds to buy a new one, this would totally get me out of ALL the wrongs I did as a child, lol. Thanks for the AMAZING giveaway~ truly. Winning the HP TouchSmart would be a dream come true for me! I would bring it with me on my travels and use it for on-the-spot digital photo editing. Digital photography is a favorite hobby of mine, and I enjoy photographing interesting points in my travels. What a pleasure it would be to have the HP TouchSmart with me on my trips for photo editing and immediate sharing with family and friends! I’m a subscriber. 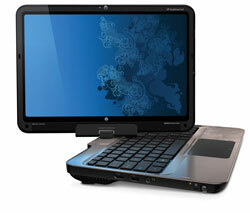 I’d use the HP Touchsmart to keep up with my work and networking when I am on the road. My son is an artist. I would give this to him to create beautiful art, then decorate my home with those creations! This would be so special and so meaningful for my mother so that she can stay in touch with her friends and family. I would give it to my fiance’ as a late b-day gift ( her’s is 2morrow- 4-27 ), because she is just starting out as a one-of-a-kind fashion designer ( www.TheFallenStarBoutique.com ) and she desperately needs one! Sounds cool! Thanks for a chance to win one. Subscriber. If I won I would give the TouchSmart to my son who is graduating this year and going away to college. Thanks for the chance! I would give this to my wife who really needs a new computer. I WOULD GIVE THIS TO MY DAUGHTER WHO IS STARTING COLLEGE THIS YEAR. I would use it as my primary computer to replace my very old Sager laptop. I would use it in my (volunteer) calling as Young Mens President for my church. I would be able to keep track of what the boys need to do and achieve, goals, campouts and activities, awards and needs as well as keep organized in the various meetings. It would be a lifesaver. I would use the HP TouchSmart to stay in touch with friends and family while traveling. I would use it have I travel, as the airports and airplane have long wait times. I would love it for use at home for me and my teenage daughter and son for school projects. I am a subscriber! If I won I would give the computer to my 18 y/o daughter that is in college (early!). It would help her studies to be able to “work” on her laptop during workstudy! I would use the Touchsmart to surf surf surf the web. I would use the Tablet to practice the use of a digital stylus and touchscreen to master the elements of this new feature in computing. This would make an AWESOME gift for my twin daughters. They are both really good artists and could use this to create art. I know it’s on their wishlist. Thanks for the chance! I subscribe (pricousins at aol dot com) and I would use this for EVERYTHING. I love this pc! I would use it primarily as a work PC. I work @ a small Catholic school, and ever since I got a chance to play with one of these I’ve been lobbying to get one. As a travelling teacher, it would be great to be able to keep all of my information (Seating charts, phone call lists, lesson plans, print-outs, gradebook software, etc.) with me as I go from room to room! Our tech budget is modest, and splurging on one of these just isn’t feasible. So here’s hoping! I could really use this at work, as we have no modern techy stuff at the job. I was recentley laid off and I am going back to college. I need a new computer so bad. I would use it to help me with my college classes. I would take more online classes to be avail for my 4 boys more. I would let my two kids that are in high school use it for homework. I would finally, finally be able to use a computer at my leisure; I currently share the family computer. I would take notes with it. I’d try to draw with it as well. Great product! if i won this, i’d have something to do while i was doing laundry in my dreary, dark & boring basement! If I won, I’d use the TouchSmart for my volunteer work and for personal use…I’d finally have a computer I wouldn’t have to share yay! I would use it for keepingup with my emails and keeping myself and the kiddos entertained while on the go. I am disabled. I think it would be nice to win this so it would be easy for me to look recipes up in the kitchen. Rather than have to go to the desk top computer. I would give it to my mom for mothers day. She really needs a new computer, as its not easy to get on the computer while sharing it with 5 other people. I subscribed! and I would use the HP to get out of this dusty dark ole office when I want to use a computer and do my internet wonderings out on my back deck in the sunshine!!! I would use it for travel - photos, drawings, notes - countless ways to scrapbook, stay in tough and least we forget - work! Great computer and the touchscreen is a bonus. Would love to take some online courses and give my current computer to my son who’s been hinting he wants one. I am a subscriber and following on Twitter @2boysblue. I would use it for my husband’s Electrical Business and for personal uses as well. This would be a great computer for my graphic design work! I would love to play some MMORPG games, use it for my college classes and photo editing programs! I would use the TouchSmart to give me more freedom when I work. I could work outside when the weather is beautiful, on the road, or wherever else I am. No more being chained to a desk! I would give it to my son who will be going off to college soon.